We have eaten well in Italy. As you might expect, pizza and pasta have featured. I was pleased to discover that pasta is not necessarily made with egg and that cheeseless pizza can be accommodated without question (or horror, which is sometimes the case elsewhere). I've also enjoyed some less Italian but veggie-friendly eating options. Whilst in Taormina, we took advantage of our apartment balcony to eat in on the nights we were together. One of these evenings featured take-away pizzas from Etna Restaurant, a restaurant that is deservedly well-reviewed. I had the vegetarian pizza minus cheese and Mr Bite had it in its standard form. The pizzas were delicious and featured thin bases that managed to be crispy and doughy at the same time. Interestingly, in addition to tomato, courgette and aubergine, the toppings included radicchio lettuce - not something I'd have thought to put on a pizza. It worked surprisingly well as the chopped leaves turned crispy when cooked. This meal was a good testament to Italian pizza and also seemed good value as our large pizzas were 8 euros each (£6 / AUD $13 / US $9). They were even large enough to yield leftovers for lunch the next day, facilitating the better lit photos above. We also cooked some meals ourselves in Taormina and particularly enjoyed trying out the Valsoia brand of vegetarian products. On our first night we had their schnitzels with jacket potatoes and salad. The schniztels were very like the Australian Fry's schnitzels and we both enjoyed them. We also enjoyed their Drumstick-style ice creams. We agreed a mint flavour would have been perfect, but even in vanilla, the cones with chocolate and hazelnuts were delicious. For our last night in Taormina, I bought some of the beautifully coloured pasta that I'd been admiring over our time in the town. These bows were coloured with turmeric, paprika and spinach. I flavoured the pasta simply with tinned chopped tomatoes and sauted red peppers, plus copious dried oregano which was left in the apartment. With some salt and pepper in the mix too, the result was enjoyable, if not quite to the standard of a local restaurant I ate at with conference colleagues. At that meal out I had macaroni with a tomato-basil sauce, which was delicious, if not as fun as our coloured pasta bows. In Taormina our breakfasts were simple affairs revolving around fruit and bread / toast. In Rome, we moved from an apartment to a small hotel (Villa San Pio, which I would recommend as a good value option with beautiful gardens) that provided breakfast. I was pleased to reacquaint myself with cereal and even more pleased at the selection of fruit and the presence of soya milk. In the afternoon, the hotel's garden breakfast area turns into a bar and I used this to try my first soya cappuccino. I don't know why I waited until Rome to do this, because I now understand what the fuss is about with Italian coffee. I was amazed when I took my first sip as it was like no other coffee I've had before. To say it was excellent would be an understatement. I need to come back to Italy just for the coffee (although I know no true Italian would drink cappuccino in the afternoon)! When not at our hotel, we have been busy soaking up the sights of Rome and I shall share those images in a separate post. (I took about 100 in the Colosseum so there will be some culling first...) We have had to be selective with places to visit and the same applies to places to eat; there are several appealing vegan places I haven't been able to take in, including vegan gelato stalls and the raw vegan chocolate and desserts from Grezzo. We did, happily, make it to Universo Vegano for dinner. This is an Italian vegan franchise focusing on vegan fast food, including veganised burgers, pizzas and wraps plus some salads and an impressive selection of desserts. Vegan fast food isn't my favourite category of vegan food, but it is fun on occasion and has the important advantage of appealing to Mr Bite (he is less enthused by raw food or vegan food that revolves around grains and pulses!). The store is quite small so we took our food away and ate in a nearby piazza. I'm afraid I took no photos there as the light was low and I was too focused on enjoying the scenes and our food. Mr Bite had a vegan cheeseburger that he rated highly, and I had a salad with crumbed tofu strips on top of lettuce, olives, tomato, bean sprouts and chopped almonds. I found it the closest thing to a chicken salad I've had in years and very much enjoyed it. I had a bite of Mr Bite's burger too and found it impressively cheeseburger-like. We took dessert back to our hotel and I also snapped a photo of the impressive dessert collection in store (above). 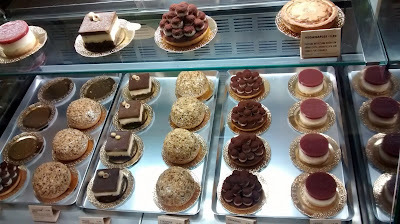 I picked the vegan tiramisu, hoping my tendency to like veganised desserts better than the originals would prove true. The concept of a vegan tiramisu was also so impressive that I thought I ought to try it. Sadly, I think it was too authentic for me! If you like traditional tiramisu and cream you would be pleased, but as I don't, I found it OK but not great (although I did like the biscuit base). I can hardly complain for it being true to the original though. Mr Bite had an 'apple pie' that was more like an apple cake than a pie, but was enjoyable in that form. Another worthwhile take-away stop in Rome is Green and Go. This is an attractive salad bar that allows you to customise vegan and non-vegan salads. You pick a base (lettuce, quinoa, couscous, rice or beans) and add one of several standard sets of toppings (I suspect you could create your own from scratch too). I went for the standard vegan toppings over a lettuce base, and it was a delicious hit of vegetables (courgette, fennel, sweet corn) with tofu, almonds and croutons. So there we have it - some food highlights from the trip. The lack of proper restaurant meals reflects me dining out (sans camera) over the conference, and our tendency to be more casual when it's just us. However, my restaurant meals were enjoyable too and I haven't actually had a bad meal on our time here. Etna Restaurant is located at Via Dietro Cappuccini, 3, Taormina. At the time of writing the restaurant website link isn't active, but reviews are available on Trip Advisor. Universo Vegano has a webpage in English and Italian at http://www.universovegano.it/en/ and the Rome store is located at Piazza del Paradiso, 18, Roma. At the time of writing they are open from 12.30pm-3.30pm and 7.30pm-10.30pm Tuesday through Sunday. Green and Go has a webpage in Italian at http://www.greenandgo.it/ and is located at Via del Boschetto, 20, Roma. At the time of writing they are open from 11.00am - 4.00pm daily. What are your favourite Italian dishes? oh wow, that looks good! So jealous of anyone living in Europe/UK! I regret not traveling more when I lived in Amsterdam, everything was a train ride or short plane trip away! I can see how you get complacent when here though - we're trying to keep getting to new places but there's so much locally it would be easy to just stick in the UK! I never used the kitchens in youth hostels either :D I think I need my own kitchen to cook! I actually found it fairly easy to find vegan meals in italy, but I was surprised at how accommodating the restaurants were too. I guess vegan is not so unusual now. Thanks for sharing your Italian odyssey with us. It looks like you had fun. What an amazing array of vegan eats you found there! I used to adore Tiramasu so I'm sure I would love that vegan version :) It's great to hear that egg-free pasta is available in the restaurants. I always assumed their pasta would be fresh (ie. egg) so I've always steered clear. Next time I'll definitely look out for it. I will have to go back to take in the many things we didn't see but I hope you can get there for a taster (literally!) at least :-) And I thought the same about the pasta!